The Business4Good Blog Think Good, Do Good, Be Good. I have concluded my blogging on Business4Good. This week over 7000 participants from all over the world gathered in Addis Ababa, Ethiopia, for the Third International Conference on Finance for Development (FFD). Someone called it the biggest conference having been held in Africa ever. Certainly, Addis was in 'FFD-fever', hotel prices skyrocketed and conference rooms were overfilled. On 13 July 2015 the UN Secretary-General Ban opened the gathering with the challenge: 'World leaders must put aside "narrow self-interest" to break a deadlock over how to finance the United Nation's bold new global development agenda'. While the official, governmental discussions continued in the main conference rooms, over 200 side events were held. International organizations, governments, private sector, civil society and academia shared their perspectives. Personally to me, FFD3 was a demonstration that the UN and it's processes remain relevant and critically important. Who else could bring together officials from 193 countries with all types of stakeholders from society and business? Who else can facilitate global dialogue on most complex issues? Is this sufficient to solve the world problems? Of course not. It will take even greater ambition, leadership and self responsibility by everyone to translate aspirations into reality. The new sustainable development goals (SDGs), to be signed off in September at a special UN summit, will be a new shared ambition of global leaders to make sustainable development a reality. After more than 8 years as a blog focused on "business as a force for good", this blog is transforming. Mirroring my own personal and professional development, it is time to look beyond business. Yes, business is a major force for change and development. So what force then, is stronger? People. Changemakers and leaders. You don't need a title to be a leader. Each person is a CEO, each of us a boss. Aware of it or not, each of us is the boss of our own life. This translates to greater self-responsibility and self-power. If one is less aware of this fact, they might not see themselves as the creator of their own destiny, but rather consider themselves as a consequence of their circumstances, upbringing, interactions with other people, etc… but that is only part of the 'story', at best. There is increasing awareness that each of us is indeed THE change agent in our life. This relates back to leadership since at the core, we first lead our own life before we lead those of others. Because how can you authentically lead others if not by example? Long story short, transformational leadership and self-empowering approaches have captured my imagination. I myself have seen the transformational changes that insights and breakthroughs from within can cause. I have also seen the non-effectiveness and lack of sustainability of superficial 'outside' aid. 1) I have seen UN colleagues overcome deep frustration and blossom at work, after participating in a transformational leadership program. 2) Or take Youchaou Traore from Mali, who was this tree child and became an entrepreneur, a school and NGO director due to his passion, perseverance and can-do attitude. Those opportunities were not afforded to him otherwise. Therefore, the Business4Good blog is going into hibernation. Something new about transformational leadership is going to arise... as a butterfly does from a caterpillar. 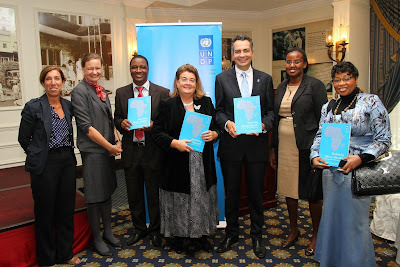 Africa is on the move - Transforming itself - How to put the Intentions into Reality? 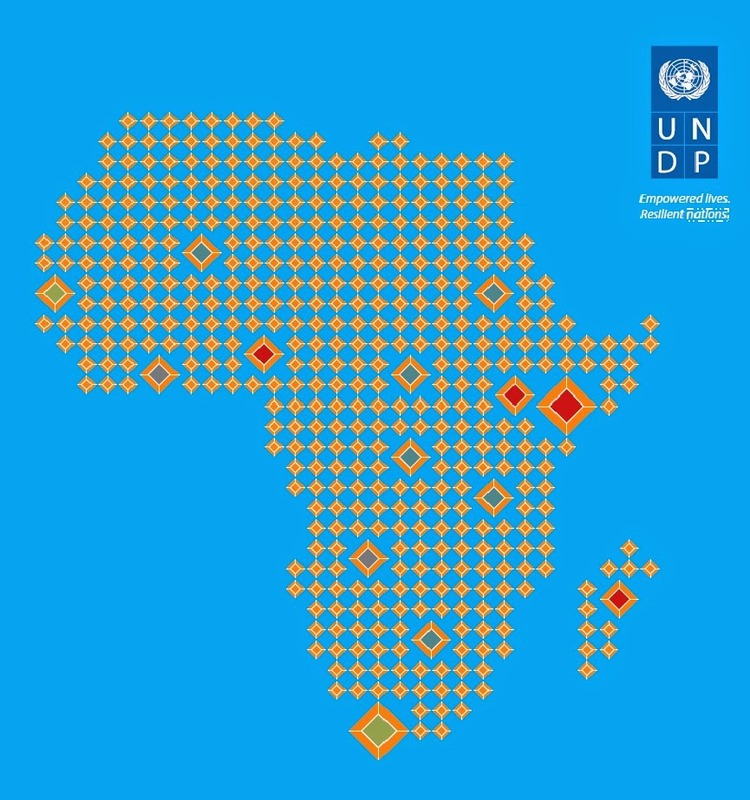 Last week I attended the Global Compact events hosted in Addis Ababa, co-organized by UNDP AFIM and other UN agencies, entitled "Africa: Advancing Partnerships and Responsible Business Leadership". It was an interesting event - held for the first time in Africa - bringing over 300 participants together from business, Global Compact networks, UN and government. One of the key topics was on the role of business in Africa's Economic Transformation which is a hot and complex topic. One of my key observations was that Africa is transforming itself, partnering with various actors from China, Europe, US etc... while multinational companies do play a role it is increasingly clear that it's African policy makers and business people in setting the continents own agenda. The new mantra that economists and development practitioners are reciting to tackle inequality and achieving development goals is "inclusive growth". As UNDP's Eugene Owusu stated "inclusive growth needs to be job rich, and the private sector has a major role to play". UNDP AFIM sees inclusive growth (macro) achieved by inclusive markets development (meso) and inclusive businesses (micro). Participants also mentioned social entrepreneurship and responsible investment - next to inclusive business - as key ingredients. "Jobs don't fall from heaven, they need to be created by responsible entrepreneurs" said UN Global Compact's Georg Kell. Overall there is agreement that business needs to go well beyond philanthropy and CSR, towards making its core business better for societies and the environment. Owusu concluded that "responsible and inclusive business can transform poverty into prosperity for all." Africa is expected to be one of the world's fastest growing regions, with 4.8 percent growth in 2014 and over 5 percent in 2015, according to the recent African Economic Outlook 2014. However, while this transformation entails growth it goes well beyond it. Transformation is much more fundamental and usually more leap-frogging and disruptive as incremental growth. The African Union Vision 2063 is an attempt to visualize how a continent with so much potential could transform itself. The jury is still out and to predict Africa's transformation requires more soul-searching and observing. Addis Ababa, as Africa's diplomatic capital is an interesting example in this transformation process. People who visited it some year ago, hardly recognize the city with its tall buildings and all present construction sites including a new light rail, ring roads and express way. How to put the Intentions into Reality? Most of the discussions were interesting with largely agreeing participants on what is needed (such as we need more and better infrastructure, education, skills, infrastructure, jobs, policies etc...). The WHAT was well articulated but less the HOW. So this question of the moderator Peter Ndoro (SABC) resonated with me: "How do we turn intentions into practice?". Unfortunately this question came in the closing and I wish it to be a starting question for future meetings. Less wishful thinking but deeper reflections on getting to the core of making it happen. What role does Attitude play? A similar 'game-changing" question arose in a special session on education. UNICEF stated rightly that "education is not an expenditure but an investment". And the discussion continued with diagnosis of what is and what is needed. What role does our thinking and awareness play? (as thinking leads to decisions and actions). How to see development more holistically, from personal to societal? Let's take some young entrepreneurs as an example. Will they do better or worse with a "can-do" attitude? With being open-minded, self-motivated, passionate, pro-active, solution-seeking? (even if all other environmental and support factors would be the same). If so, then how can we empower people and entrepreneurs, how can mind-sets and inner attitudes be shifted? These dimensions do matter and can be developed if taken into account. Otto Scharmer calls the 'inner' side our blind spot. Unless someone has tried meditation or a a similar practice it is a difficult topic for economists and development practitioners to grasp. But until we learn from the personal development, coaching and psychology fields, I feel we are scratching the surface and could do a much better job with a more holistic 'inside-out' development approach. "Development is not something that we do for people. Development is what people do for themselves. It must start and end from within. Our job is to facilitate the process." Happy International Day of Happiness! 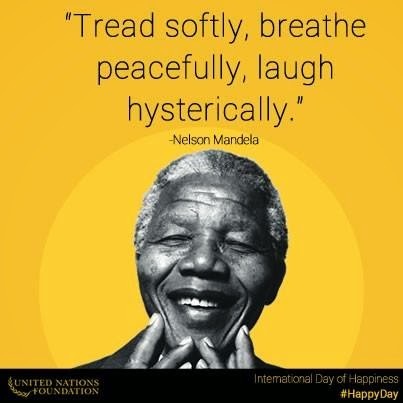 The UN General Assembly resolution 66/281 in 2012 proclaimed 20 March the International Day of Happiness recognizing the relevance of happiness and well-being as universal goals and aspirations in the lives of human beings around the world. I have written in an earlier article why I agree that we urgently need an approach that aims at a higher goal rather materialistic 'wealth' in my blog on "Happiness as a UN goal? The Inside-Out Development Paradigm?". A happiness day can raise awareness with people and policy makers alike to explore more holistic approaches to human development. One of the most inspiring books in this regard I have ever read is "Most of All, They Taught Me Happiness" by Robert Muller (here on Amazon). The book is a fascinating life story of an authentic person embodying the spirit and value of the UN. I therefore highly recommend it to anyone who wants to be inspired and learn about the UN's evolution. Muller fought in WWII and developed a passion to overcome wars by uniting countries beyond borders. He first joined the UN as an intern and rose through the ranks over a 40 year career to become Assistant Secretary-General under three Secretary-General. He was known by some as "the philosopher of the UN" and his ideas about world government, world peace and spirituality led to the increased representation of spirituality in the UN. As a visionary leader he was instrumental in the founding of numerous UN agencies and programmes, including UNDP and WFP. Muller received numerous awards and was nominated repeated times for the Peace Nobel Price. "Are you happy? Decide to be happy! Happiness is a state of mind, a conscious, determined decision or will to embrace with fascination, enthusiasm the entire world and creation. Happiness is total consciousness. Happiness is not external to man, it is a genial force in him, an attribute, an essence of the human person." His legacy lives on in many inspired coworkers and people, and also in the UN University for Peace in Costa Rica whose first Chancellor he became after retirement. Muller furthermore documented over 7000 'idea-dreams' who are disseminated in a daily, inspiring newsletter (sign up here). Interesting for all UN staff, consultants and Global Compact member companies working with the UN, is this "Transformative Leaders" 2014 Training Programme which I had the honour to co-create and also participate in last year. I am delighted to invite you to engage in an exciting leadership programme being offered by the UN Transformation Network - a network of innovators and change makers in the UN system who want to transform the UN from within. Last year, our first programme generated excellent feedback and so, due to its success, we want to build on the momentum and launch more sessions. The practical skills I gained in communicating, inspiring others and leading in complex situations was especially impressive. It helped me achieve my learning goals of leading positive change and innovation as well as connect with like-minded colleagues. The overall intention of this leadership programme is to build the skills and capacities of UN staff - at all levels - so as to increase personal effectiveness and to evolve the UN system to have greater impact and relevancy. We hope to catalyze UN innovation and collaboration to enable colleagues to deliver even more powerful results in the field. This is a transformative inside-out approach to development as we believe that leadership potential exists within everyone, regardless of role. The time is now to harness our wisdom and creative intelligence because the sustainable solutions we seek reside within each of us. One of the best part of this course is being part of a bright, innovative and motivated group of peers who generated support for doing things differently. As one participants from UNDP BDP said, "The course introduced us into a new world about transformation and leadership. It's not enough to have the motivation to be a leader or an innovator, you need the knowledge and skills to understand change, see how this plays out within organizational cultures and structures, and manage the processes to guide transformation. The course filled this vacuum." Another colleague from the Ethiopia Country Office said, "It gave me the confidence to speak up and the skill set take positive action." Please note that there are both in-person and on-line cohorts and all UN agency staff and consultants are welcome to participate. The NY session starts on April 3rd, the Geneva session starts on March 27th. I am currently working on creating an in-person course for Addis Ababe in fall 2014, please email me in case your are interested. For more details on this unique programme, please visit: http://transformative-leaders.org. Feel free to pass this message onto other colleagues who may be interested. There are limited seats so I encourage you to take action! Lastly, please consider joining our LinkedIn network group - the link is below. We now have over 300 members world-wide, consisting of all UN stakeholders, and the conversation keeps growing. PS: Thanks a lot to Patrick McNamara for drafting the brochure and excellent facilitation work, and to Elizabeth Soltis for inspiration and a lot of the text of this article. Happiness as a UN goal? The Inside-Out Development Paradigm? Since the UN General Assembly declared 20 March the International Day of Happiness in 2012 the idea of happiness as a goal for development and global well-being has gained even more traction. 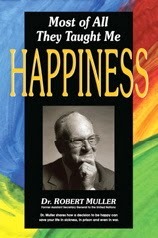 Discussions advance happiness not just as a personal matter but also a global development goal. UN Secretary General Ban Ki-moon is personally very interested in the new development paradigm including global well-being, happiness and Bhutan's Gross National Happiness (GNH) index. The 2013 UN General Assembly Note called "Happiness: towards a holistic approach to development" gives a clear recognition of broader measurement of development beyond GDP and a call to further action. Recently and during my holidays in Germany, I attended the first 'Global Well-being Lab Forum' in Berlin. It was organized by Germany's GIZ Global Leadership Academy (commissioned by the German Federal Ministry for Economic Cooperation and Development (BMZ)), the Presencing Institute and the GNH Bhutan Centre with OECD, Italy, Finland, World Bank Institute et al. also being active. 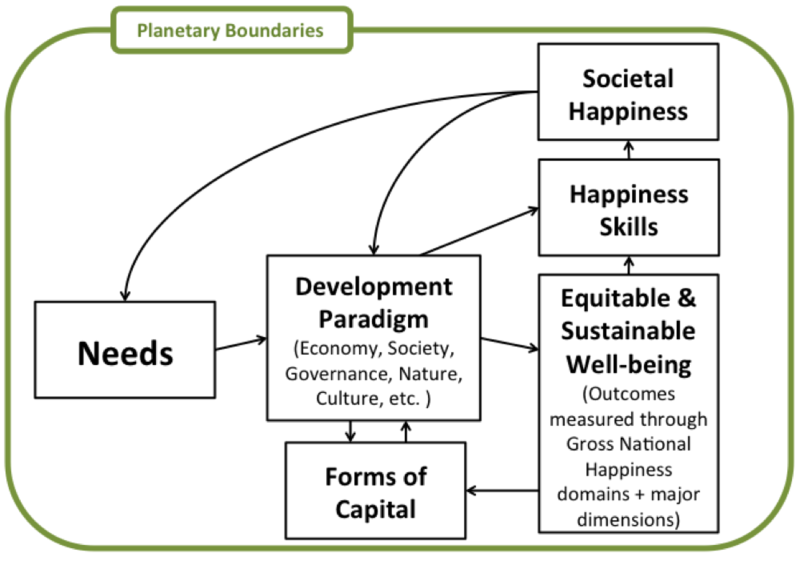 See a key diagram by Enrico Giovannini, former OECD economist pioneer, mapping the links between needs, skills, forms of capital, well-being and happiness with the new development paradigm (see also at the bottom the resource library giving an overview of other initiatives presented). For me personally very interesting is that this new development paradigm seems neither top-down nor bottom-up but 'inside-out'. A key insight that I heard from both the Bhutanese monks at the forum but also Otto Scharmer, Founder of the Presencing Institute, is that "transformation has first to happen inside oneself, then it manifests outside". This new field appears to be an exciting, innovative approach promising transformative impact and contributing to the realization of long-term development goals for all. 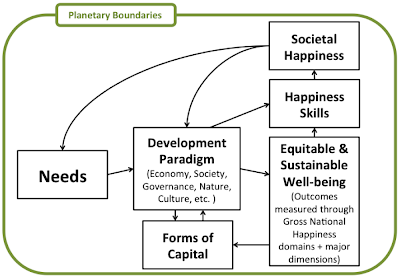 Are we seeing a new development paradigm 'happiness' emerging? At the moment this space is still relatively new and much more research is needed to make the new approach practical. Given my strong personal passion for the topic, I am considering to explore this new development paradigm through an action-oriented PhD thesis with a German university while continuing my work for the UN. Key part of the initiative would be to interview global change-makers and transformative leaders to synthesize insights on realizing the new emerging development paradigm, from theory to reality, within the UN context. What about the title 'transformateurs'? Suggestions for interviewees? For further information see also the very informative resource library by Stefan Bergheim, Centre for Societal Progress. Looking forward to hearing from you. Is the business & development paradigm changing? 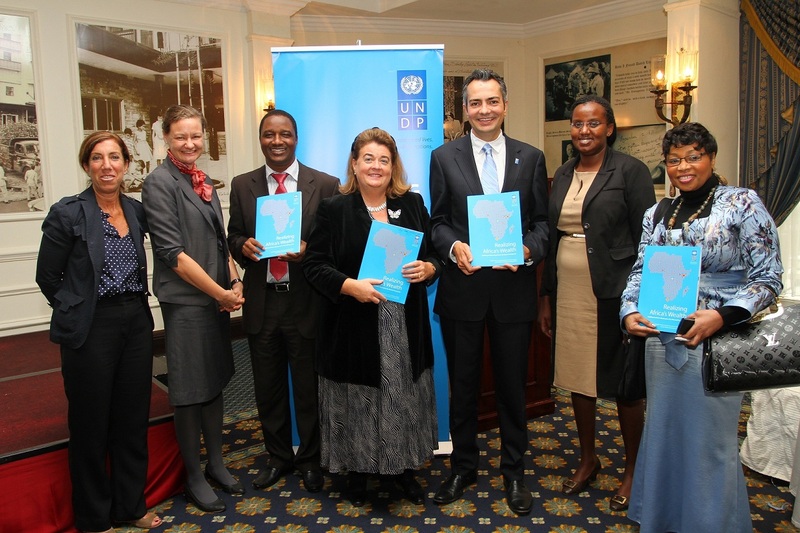 Last week I had the honor to travel again to Kenya to present on the key findings of the major UNDP AFIM report “Realizing Africa’s Wealth – Building Inclusive Businesses for Shared Prosperity”. It was great to discuss with private sector companies such as Novartis, development partners (DFID, Sweden, Denmark), government representatives, media and UNDP Kenya colleagues the concept and successful cases of inclusive business models in Africa. Kenya is such a hotbed for business innovation and together with South Africa has the most inclusive business models as identified in the report. Most cases are in agriculture, financial services, ICT, energy, water and extractive industries. Read the report for more details. Personally I see Inclusive Business demonstrating that good business does well by taking a more holistic and long-term perspective with a shared value and triple bottom line approach of social, environmental and financial dimensions. This goes hand in hand with the current paradigm shift in development cooperation from traditional aid towards greater individual empowerment, self-responsibility, local ownership and business engagement leading to more inclusive markets and sustainable development.